One of the services that many businesses turn to as they grow is a professional order fulfillment company. Outsourcing this function is an expense many businesses find worth the cost. Fulfillment services store, pack, and ship the products you sell for you. They provide the processes necessary to receive, service, and track orders sold via direct marketing. There are different types of fulfillment services based on the product or service sold. The differences among fulfillment services arise from whether the sale is a one-shot or involves continuous service over time, whether there is one product being sold at a time or many, whether the sale is on a cash or credit basis, the nature of the product being sold and its delivery requirements, and the type of statistical information that must be compiled. Product Fulfillment is the process of product manufacturing, warehousing, assembly, quality control and delivery of product directly to customers without the finished product going back through the company that has created the product. Customers usually place their order via an internet website, through email, telephone, or fax. As the economy recovers, more people are returning to the workforce. Many of these workers forego traditional jobs and work for themselves in small or medium sized businesses (SMBs). These entrepreneurs have several advantages and challenges. For example, order fulfillment is difficult because most small operations have limited inventory on hand. These owners often find it easier to leave order fulfillment to an outside company rather than handling it themselves. If you own an SMB and move a large amount of inventory, consider using an order fulfillment service. Before choosing one, however, familiarize yourself with how they work. What’s an Order Fulfillment Service? 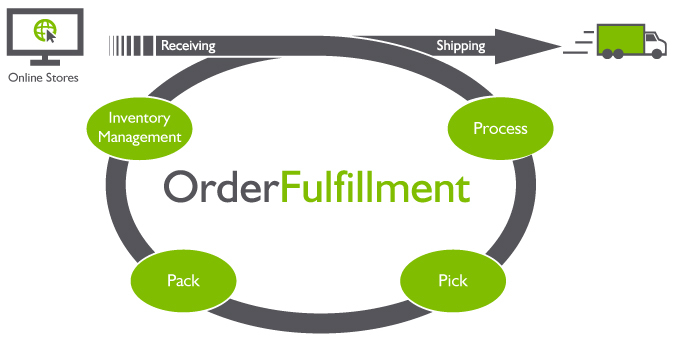 In its simplest terms, order fulfillment is the complete process of product ordering and delivery. The process encompasses every step, from the time a customer inquires about your product to the time it’s delivered. In other words, “order fulfillment” is another name for a delivery service. Each service employs different delivery strategies depending on the customers and inventory they work with as well as other factors like production and competitor lead time. The steps in order fulfillment are generally the same from service to service. Each product goes through a receiving process in which products from the suppliers are counted and inspected for damage. SKUs and bar codes are then added to products if they don’t already exist. These help suppliers, shippers, and carriers track locations, counts, and sale numbers. Your orders are then packaged together and placed in boxes to be shipped. After an order is processed, it’s shipped—which can take anywhere from 2–7 business days depending on the items you order and the demand lead time you request from the fulfillment service. The shipping service will weigh your package and determine the best shipping method for your order. If your business serves domestic and international customers or if you carry a variety of inventory with specific shipping requirements, shipping may be more complex and take longer. Inform customers of this to avoid shipping complaints. During the gathering, packing, and shipping process, orders will be continuously updated. It’s up to the supplier and shipping station to keep information current on your orders. Today’s technology allows small business owners to track orders in real time. For example, services like Amazon.com and Barnesandnoble.com let customers track packages and give them estimated delivery times. Additionally, they can show customers where their packages are any time of day. SMBs can use the same technology if they’re well-versed in the internet and shipping options. What if a Return Is Necessary? The best order fulfillment services handle returns with the same care and efficiency as original orders. For the best return fulfillment, try to give your customers as many ordering options as possible. For example, customers who order online can return products through the client’s website or face to face. Establish an internal and external return policy, and ensure both are explained clearly on your website and in promotional materials. Additionally, don’t forget to tailor your product fulfillment service to your customers. Some parts of the fulfillment service are difficult to control—such as the carrier you use. If you rely on the US Postal Service or FedEx to carry shipped orders, you can’t do much if the orders are late or if workers run into problems on the road. However, you can tailor inventory to your customers’ needs. For example, if most of your customers don’t order large products with specific shipping requirements, consider dropping those items from your inventory. You can also tailor other aspects of your business to your customers’ needs. For example, observe your competitors to see what their lead time is. That is, how quickly and efficiently can they take orders, get in touch with suppliers, and reach their fulfillment services? If your competitors are especially fast or slow, adjust your lead time accordingly. Think about your budget before choosing a service to fulfill orders. Consider how many long-distance orders your business takes on a weekly, monthly, or yearly basis. If the numbers are enough to justify an order fulfillment service, think about pricing options. Fulfilling orders may seem like the easiest part of running a business, but it’s time-consuming. Most of these services have an entire staff that spends days packing, picking, managing, and delivering orders. Depending on the size of the team and the type of inventory being shipped, most services charge setup fees that cover steps like receiving, warehouse prep, and order testing. Most companies also charge storage fees, which are different for long- and short-term inventory storage. Sellers usually charged extra for slow-moving inventory or merchandise that’s difficult to pick and pack. Additionally, most order fulfillment services charge a shipping and storage minimum. For instance, if your fulfillment service has a one-pallet minimum, its staff won’t ship orders that take up only half a pallet. Finally, your order fulfillment service can charge you weight and handling fees as well as packaging, returns process, and support fees. These add up over time, especially if you request several shipments per pay period or you deal with large, bulky inventory. Additionally, most of these fees are charged on a per-order basis. Therefore, you’ll almost never pay a flat rate for an order fulfillment service and may need to adjust your budget accordingly every few weeks or months. How long the company has been in business; this often directly affects customer satisfaction. How big the warehouse is; larger warehouses mean the enterprise is prepared to deal with more inventory. How the service handles mistakes and return policies. The type of shopping system used; some services use an online shopping cart, while others rely on PayPal or similar services. Outsourcing order fulfillment can save you significant time and stress. Though it may take some time to research which service works best for your business, it’s worth the effort. Finding the right order fulfillment service can save time and money and improve customer satisfaction. Once your online business starts to take off, the excitement of possibly making it big may cause you to overlook the important issues of packaging and shipping. Yet once your company starts dealing with more customers, such necessities will start taking up a huge amount of your time. At this stage, you should find an order fulfillment service that can package and ship your product to a high standard. It’s an important decision because you’re asking another company to take charge of your inventory and warehousing operations which are incredibly important. Choose the wrong order fulfillment service and your company could suffer as customers turn away in their droves due to poor service. That’s why reading reviews of order fulfillment services can really be helpful. Here are some things to consider when choosing a service. Location: There is a huge number of order fulfillment warehouses in the United States and worldwide so you need to choose one close to your customers. Therefore, if your HQ is in California and you have a huge number of clients in Florida; it would make more sense to choose a warehouse in New York state than any West Coast company. A warehouse dead center of the US will allow you to ship to both sides of the country for basically the same price. Speed: All order fulfillment services have their own processing policies. Many centers will not ship orders that arrive after midday until the following day. This could be a big deal if you have clients expecting next day delivery only to find that they have to wait two days. History: Don’t make the mistake of choosing a fulfillment service that is little more than a warehouse lacking any experience when it comes to dealing with inventory. Look for a company with a lengthy track record in the industry. When an inexperienced company tries to handle large volumes of goods, disaster awaits. Error Rate: The estimated industry average error rate is 1%. While this seems excellent, bear in mind that thousands of items are shipped daily which means hundreds of mistakes are still made. You need to find a company with an error rate much lower than the average. Information: Don’t do business with any company that refuses to show you their process. The best order fulfillment services have a tried and trusted process which enables them to deliver the right goods on time every time. Companies who operate in that manner will be delighted to show you the process as it sets them apart from the rest of their competition. Take a close look at their process and try to decipher if it’s well thought out or a slapdash effort thrown together at the last minute. References: Every service worth their salt will immediately be able to provide you with a list of references. Testimonials on their website is one thing, actually having the contact details of their customers is another. Reputable companies will provide this information upon request. You cannot cut corners when it comes to choosing a fulfillment service. Your business could be at stake if you choose a company that fails to satisfy your customers so be wary and do plenty of research before choosing one. Are you trying to find a quality fulfillment company that can store and ship your goods for you? Get 5 free quotes from top order fulfillment companies by filling out one simple form.